I returned to FIRE’s Philadelphia headquarters yesterday after spending the weekend at the Midwest Bisexual, Lesbian, Gay, Transgender, and Ally College Conference with fellow FIRE staff members Susan Kruth and Theresa Glinski. The conference, which was celebrating its 25th anniversary, took place at the Navy Pier in Chicago and featured workshops and other activities, including a resource fair. With our FIRE table at the resource fair, we had the opportunity to talk with countless student activists, college and university staff, and faculty members about how FIRE’s work can impact them. As this was the first conference I’ve attended since joining FIRE, it was my first chance to hear directly from students about how our work can help their activism. It was inspiring to speak with students and learn directly from them about how the work that we do each day can help them to confidently exercise their free speech rights on campus. This kind of outreach is a critical component of our work because it allows us to discover new ways to help students and faculty members confronting new challenges in the fight for free speech on campus. It also allows us to learn firsthand about the problems with censorship that students face on campus. 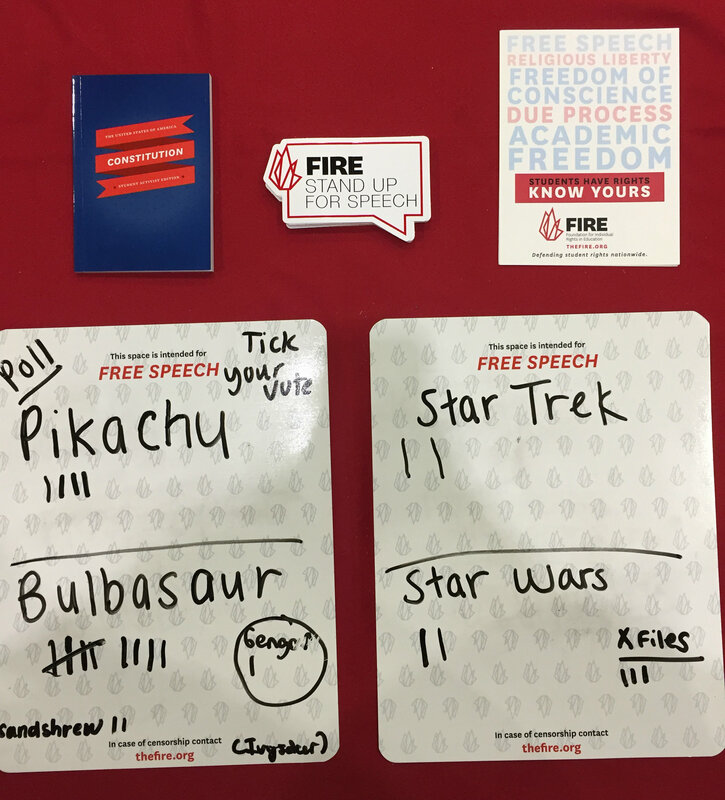 In addition to sharing FIRE’s vast resources, we also took the opportunity to show students that free speech can sometimes be all fun and games: Using our FIRE mini free speech walls, we conducted an informal poll for students to vote on their favorite Pokémon character (from the popular video game and trading card game). Our poll started with only two choices, Pikachu and Bulbasaur, but our free speech walls served their intended purpose as the poll quickly expanded to include new entrants. Some FIRE resources, including our informal Pokémon poll. It was a small but useful example of the power of free speech in action. And while introducing new students to FIRE is important, it’s also wonderful to encounter students who are familiar with our work. Krysta, an Eastern Michigan University student, was one of them. I’m glad that we were able to inspire students like Krysta, and I hope we are able to inspire many more to work with us to protect free speech. Our trip to the conference was a complete success, and I am delighted that we were able to introduce so many new students and faculty members to FIRE, while reconnecting with so many old friends. As always, we encourage FIRE Student Network members to keep in touch and let us know when there are opportunities for us to meet with them. And, as always, if you need any resources please reach out to us at students@thefire.org.